Choose from 4 stock offerings plus custom! Here are a few close-up pictures of our small tubing in different lighting conditions. Now you can create tubes longer than 60"! Our new inner ferrule tubes are designed to splice our most popular small and medium tubes together to give you any length you desire. Each ferrule has been sanded to provide a .005-.006" bond gap which is ideal for many structural adhesives. For instance our .490" OD ferrule is sized to fit inside our .500" ID stock tube. Our ferrules save you the cost of buying a full length tube to connect two larger tubes. 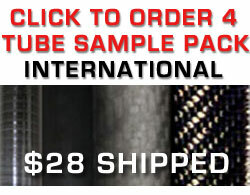 In the image below you will notice our ferrules look different from our other tubes. On the very last ply in the tube layup we add a prepreg fiberglass veil which offers a few benefits. One reason we added the fiberglass veil is to provide some shock absorption to the joint. Fiberglass isn't quite as stiff as carbon so it does this job very well. Another benefit in some applications is the ability for fiberglass to insulate a joint when bonding carbon to metal. If you cannot insulate the joint galvanic corrosion may become an issue. For a "how-to" guide on bonding tubes please see our cut and bond page. *We can sand tubes larger than 2.120" OD. Please ask for pricing. OD tolerance applies to as molded tubing. If your tube is a sanded smooth fabric tube the OD tolerance is +/-.005". We sand to a look first and then a dimension on sanded fabric tubing so the OD is usually about .008" smaller than the diameter listed in the ordering charts above. Over sanding a fabric tube will cause the pattern to degrade and under sanding will leave cello lines on the tube so possible tolerances aren't as tight as you might find with our sanded uni tubes. Sanded uni tubes will end up about .008" smaller on the OD than what is listed in the ordering charts above. We can hit a tolerance of +/- .002" on a uni sanded tube. What texture can I expect on the inner and outer diameter? As you can see in the photos the outer diameter has a slight texture from the manufacturing process. After each tube is laid onto the mandrel and compacted it undergoes a winding process where a proprietary cellophane wrap is carefully wound at a specific pressure around the diameter of the tube. This step is really the key to producing a high quality composite tube. Once the tube is wound it goes into a high temperature oven for curing. As the mandrel is heated it expands slightly while the cellophane is contracted. This provides super compaction pressure to the layup and once cured the cellophane is removed. After the cellophane is removed it leaves a slight stepped texture in the epoxy resin. This imprint is only about .003"-.004" thick and can be removed easily with an additional machining process or even sandpaper if cosmetics are more important. See more about this on our cut & bond page. The inside of our tubing is very smooth because the mandrels used to cure our tubes are machined to a tolerance of +.002" / -.0.00". What layup is used in these tubes and how strong are they? All of our small tubes are laid up with most of the layers/fibers running axially down the length of the tube. This means that our tubes will display most of their stiffness in bending. 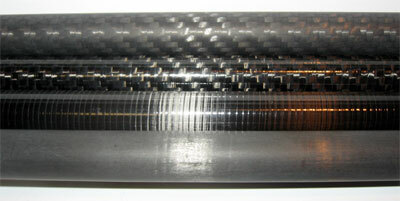 All of our small tubes are laid up using uni-directional carbon fiber prepreg. With uni-directional carbon fiber you can design in stiffness exactly where you want it. 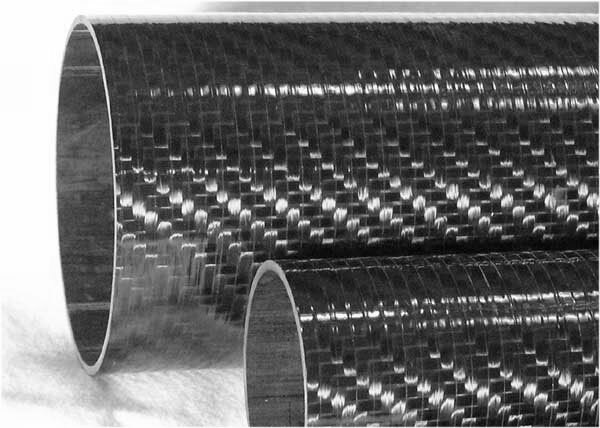 Using a woven carbon fabric isn't an option when you're designing a tube with the best mechanical properties (stiffness/weight ratio). A major benefit to using composites tubing versus metal tubing is not only the weight savings but the ability to design stiffness where you want it as apposed to a metal tube where the only thing you can do is add wall thickness and weight. Most of our small tubes feature a layer of prepreg glass at both ends which offers some torsional (twisting) stiffness. 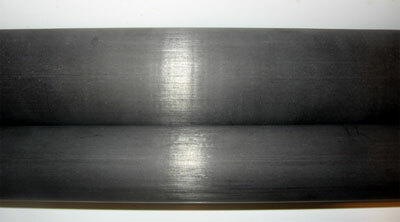 Many carbon fiber tubes on the market are pultruded. Pultruded tubes are much less expensive and there is a reason for that. The mandrel and the carbon filaments are pulled through a machine and cured at the same time. The downside is that you get very little torsional value from a classic pultruded tube since all of the fibers run in one direction. In real world situations this can be a detriment because with the slightest twist under loading can split the tube. Also pultruded tubes are typically heavier (more resin rich) which degrades the stiffness. More fiber and less resin is always best. All of our tubes are roll wrapped to avoid these problems. Like the old saying goes "you get what you pay for". It is important to note that we refer to classic pultruding in the above text. With a pultrusion process called pull-winding it is possible to include a non axial fiber orientation around the diameter of the tube. Pull winding is an automated process that runs continuously and reduces the per unit cost but also has high start up costs compared to roll wrapped tubing. Pull wound tubing is not generally available off the shelf but instead is typically used in proprietary products. 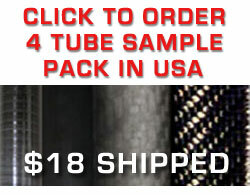 We do not offer specific load ratings for our tubes for several reasons. The first reason is because there are so many ways to load a tube that any loading data we distributed would not be useful. We offer basic information on our material properties page to calculate how a given tube might perform under your loading scenario. The next reason is legal liability. Some applications may involve threat to life and limb. Since we cannot control how our tubes are used and what safety factors are held to for a given application we do not quote any load ratings for our tubing.